Residents have been complaining about high water and sewer rates from the Hallsdale-Powell Utility District for years. 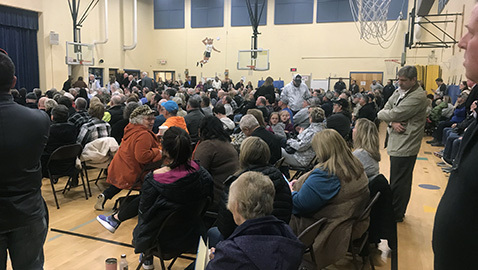 Knox County Mayor Glenn Jacobs hosted a public meeting to address the district’s water and sewage system Thursday evening at Brickey-McCloud Elementary School. The utility district serves some 30,000 water customers and 24,000 sewer customers with some 400 miles of water lines. Sewer rates are expected to increase by 6% this year and water rates may climb 4.5%. The HPUD district is under a state and federal mandate to fix certain problems. HPUD General Manager Darren Cardwell spoke for about half the meeting about the system, who it serves and some of its known problems. He said that the independent system, one of three serving Knox County, also serves parts of Union and Anderson counties. He then took questions submitted on index cards to Jacobs who relayed the questions to Cardwell. One question noted that 47.3% of the water pumped by the district is lost before reaching customers and Cardwell explained, “We still have a large water loss problem that we’ve tried to address.” He said some of the pipes date back to the 1960s and the system experiences small and large water leaks. Asked why a utility bill doesn’t go down while someone is not there and on vacation Cardwell said that the invoice may have included a “split bill” or that may someone had been in the house and left a commode running. Questions also involved the high mineral content of water, a comparison of other rates charged by neighboring utility companies, and the salaries of HPUD employees. Cardwell said he receives $160,000 a year and said that salary information is available when someone asks. He did say that beginning employees make less than if they worked for KUB. He said at the end of the meeting that the utility district and the customers will have to “pay the piper for our kids and grandkids” to update and repair the system.